National Margarita Day is celebrated each year on February 22. This year, it falls on a Monday so unless you are lucky enough to be somewhere in Mexico, it’s a festive time to visit a Mexican restaurant or make a margarita at home. When it comes to margaritas, there are many variations on the theme. Recipes often depend on the specific location where the cocktail is being made and the creativity of the mixologist making the drink. But the basic ingredients remain the same: a mix of tequila, Triple sec or Cointreau, and lime or lemon juice. Although especially refreshing when consumed poolside, preferably with an ocean view, margaritas are considered a four-season cocktail. They can be served on the rocks, frozen or straight up—with or without salt on the rim of a class. More often than not, margaritas are served in a cocktail glass that looks like an inverted sombrero. When we travel to Los Cabos to conduct margarita research, it is also an opportunity to overindulge in the cocktail’s natural pairing: freshly made tortilla chips with salsa or guacamole. 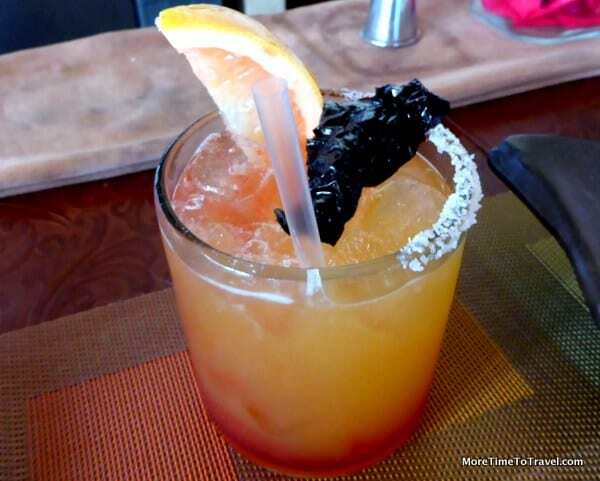 This year, we were introduced to a new margarita, which is one of the most popular and delicious libations at The Resort at Pedregal in Los Cabos. Head bartender David Hernandez graciously, shared his wonderful recipe for the Pedregal Reyes Margarita (below). Add all the ingredients to a shaker and strain into a tumbler glass with the salt in the half rim and full of ice. Garnish with Grapefruit and Pepper Tuile. The origins of this famous drink are uncertain. Some claim it was borne in Mexico, others say Texas, somewhere between 1930 and 1940. But a similar drink called a “mezcal brandy” won an award at the Chicago World’s Fair in 1893, according to The Complete Book of Spirits, by Anthony Dias Blue. Esquire Magazine is said to have published the first recipe for a margarita in its December 1953 issue. According to the IBA (IBA Official list of Cocktails) the standard proportions of a margarita are 50% tequila, 29% Cointreau, and 21% fresh lime juice. Freshly squeezed limed juice is considered key to making a good Margarita. Margaritas can be made with any type of tequila—blanco, reposado or anejo; each changes the character of the drink. Perhaps one of the most expensive margaritas is called the “Cadillac” because the ingredients include Grand Marnier and reposado instead of blanco tequila. Contrary to what you may guess, the Margarita is not the most popular tequila-based cocktail in Mexico. It’s the Paloma (made either with tequila and grapefruit-flavored soda or with grapefruit juice and club soda, both with lime juice). Salud! Do you have a favorite margarita? That’s my kind of Holiday–National Margarita Day! Love those Margarita recipes–thanks so much! Three cheers for National Margarita Day! I love your photos of the different margaritas. I’m thirsty now. I think I would like the Pedregal Reyes margarita. I’m ready for my happy hour and margaritas — after all, have to do my part to support a good cause! I am so sorry you had to do so much research! They all look amazing! I am a big fan of the Margarita! Someone had to do the hard work, Suzanne! My favourite line in your post was “conduct margarita research”. You DO know your stuff and although I don’t drink them that often, I was delighted to hear that they can be four-season cocktails! Oh no! It’s the 22nd! No tequila around. Maybe we can make something out of beer and wine and take a rain check. My favorite is still the traditional lime margarita with salt on the rim — the perfect accompaniment to guacamole and chips! More likely to make you happy–than healthy! I could definitely go for one now after my hula class, these all sound good but the most intriguing drink for me would probably be with the tamarindo, I found of those, so the drink version would be so delicious, I’m sure. Tamarind sure makes a nice flavor addition to a Margarita! I was at our weekly Karaoke Time last night at the Viewpoint Golf Resort in Phoenix, Arizona and the host sang Margaritaville. Now I know why he did! Do you know from where the name came? Jimmy Buffet’s song did come from the drink—he also has a chain of hotels with that name. I see you really did your due diligence on the research Irene. I’d love to try the tomato margarita that sounds really really different and delicious. What fab-looking margaritas! Exciting news in Santa Fe for National Margarita Day- the city introduced their upcoming Santa Fe Margarita Trail at a press and industry event. Starts fittingly on Cinco de Mayo- a good reason to come back to Santa Fe for a visit. I was recently in a cafe in Auckland which had ten different types of margarita and a book about the history of the drink – my kind of place! Didn’t know there was a National Margarita Day, I’ll have to look out for it next year. Sounds like an interesting tasting flight! I love the fact that you conducted Margarita research! Good to know there are so many variations on a there and I love the tomato version-would be a fun change from a Bloody Mary-but I think the Paloma will be the next one to try on my list.